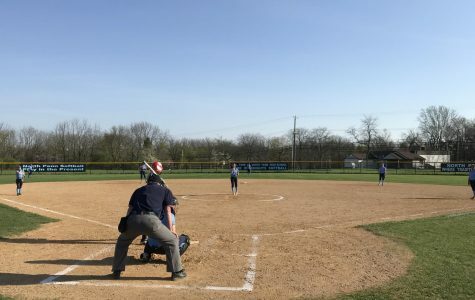 SOFTBALL- On a beautiful, windy day the Knights were led by a strong pitching performance by freshman standout Mady Volpe and the strong bat of junior Victoria Juckniewitz. 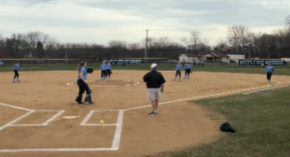 The North Penn Softball team fought it out on the field against the Patriots of Central Bucks East with a final score of 5-4. 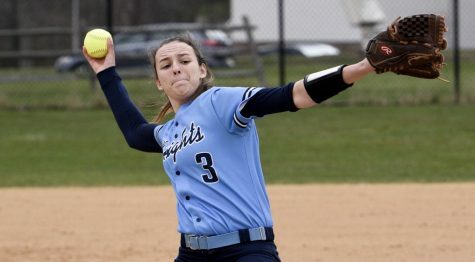 On a beautiful, windy day the Knights were led by a strong pitching performance by freshman standout Mady Volpe and the strong bat of junior Victoria Juckniewitz. 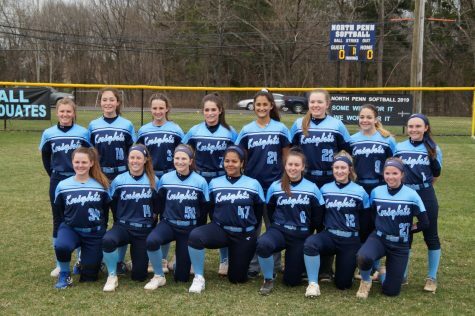 The Patriots were in the game the entire way, led by a strong pitching performance from Giuliann Ruscio and a powerful swing from junior Alyssa Catron. The Knights entered play 3-0 in the season, but facing a good CB East team was not going to be easy. Both teams played good fundamental ball through the first two innings, however the third inning is where play picked up. 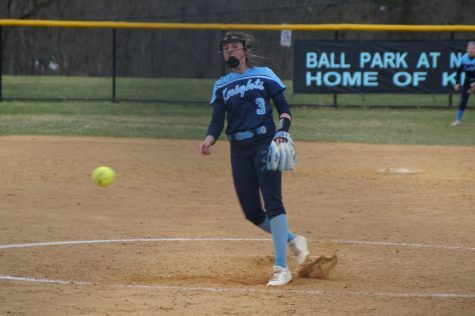 After a one out walk by CB East’s Sydney Eckert, North Penn failed to get crucial outs against the top of the order. Alyssa Catron stepped up to the plate and crushed a double into the center right gap, driving in all 3 baserunners. In the bottom half of the inning, the Knights got some runs back. Three consecutive errors made by the Lady Patriots allowed both senior Tori Chiu and Emily Groake to each get a run on the board. In the fourth inning, Tori Chiu got a infield single, setting the table for the top of the lineup to do damage, and they did just that. With one out, Victoria Junkniewitz hit a line drive double allowing Tori to score. 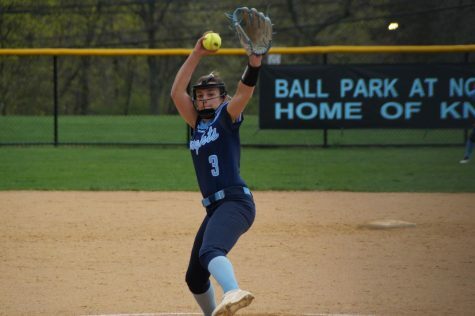 Entering the fifth inning, the game was tied 3-3, yet an experienced North Penn team stayed on course. After a one out single by Jordan Pietrzykoski, CB East hurt themselves again with two more fielding errors, allowing Jordan to score the go ahead run in the game. Both teams entered the sixth frame with strong pitching performances and timely hitting. 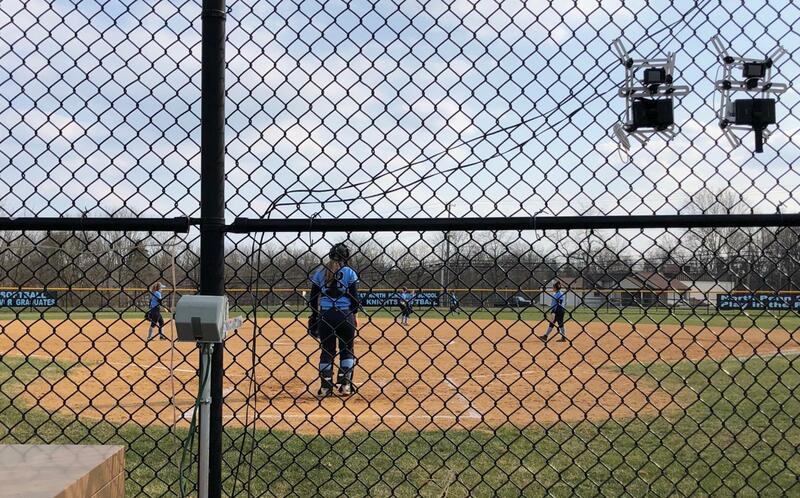 Alyssa Catron led off the inning and did exactly what she needed to do with a go ahead solo shot over the left field fence. 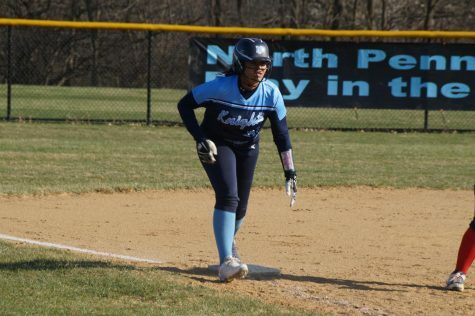 She made her bat known today, driving in all four of CB Easts runs. But it was not enough, as the Knights got the lead right back in the bottom half. With Emily Groake on first, Junkniewitz bunted a ball towards the third base. As Junkiewitz was about to lay down the bunt, the third baseman simultaneously ran towards home plate to field the ball. 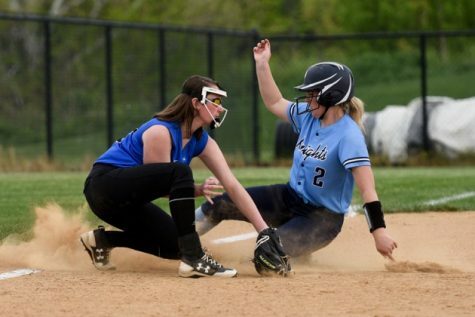 However the ball popped over the third basemans head, allowing Emily to advance to third and Junkniewitz to second with aggressive base running. A sac fly from Elia Namey two batters later allowed the Knights to recapture the lead and keep it for good. 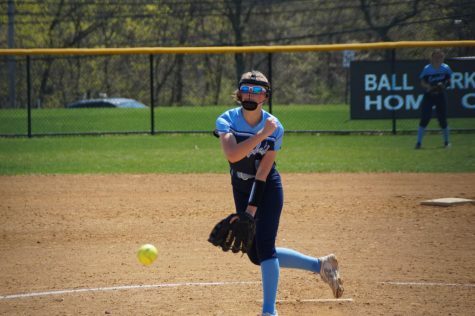 Mady Volpe kept it going into the seventh and a timely double play to end the game was all North Penn needed to seal the victory. 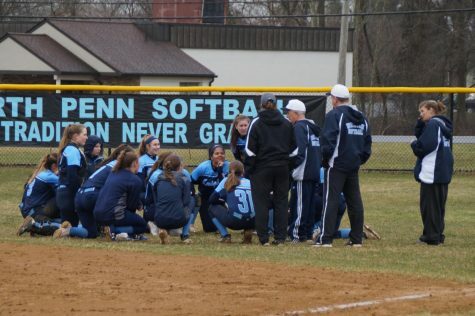 North Penn advances to (4-0, 3-0 SOLC) on the season and plays Haverford HS tomorrow for a non-league match up at home. First pitch at 3:45.